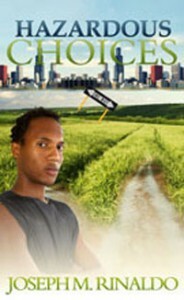 Hazardous Choices tells the story of a former street gang member trying to make good in a new life in a small Kentucky town. With a place on the football team, new friends and a chance to start over, things are looking up for Darnell. However, in the Summer he returns to his former neighbourhood and becomes embroiled in gang ‘politics’ and hazardous choices transform Darnell’s life once again. There are aspects of the book that make for a well written story. Despite some very poor choices, Darnell does come across as quite a sympathetic character, embroiled in a culture that originally seemed to offer security but which quickly becomes a burden. There’s an incredible weight of expectation on this young man and Rinaldo does manage to get the message across that the walls seem to be closing in on his bright new future and the panic that that creates in Darnell’s world. There were other aspects of the books I found harder to connect with. There is quite a lot of jargon about football and even though this is a huge part of Darnell’s world I did think it was sometimes overplayed within the book. Additionally, sometimes I did feel that the book was slightly repetitive or circling. At 279 pages, some of it felt a little like ‘filler’ and it could have been stripped down. Rinaldo shows promise with this title and does seem to have an aptitude for character development and a good storyline. While the book didn’t rock my reading world it was an interesting story. **Review originally published on Tweedle Dee and Tweedle Dave. I received a copy of the book in exchange for a fair and honest review. I did not receive any additional compensation and all views are my own.